I put out my hoop houses today to continue to warm the soil before transplanting. My hoop houses are green house like structures that the plants will stay in until late May to keep them warm and protected from the elements. Ideally I would put the plants into their hoop houses on Saturday but the weather is looking to be bad so I am going hold off until Monday evening. My hoop houses have 2x4 wood bases with a 7.75' x 6.5' dimension. I drilled holes into the 2x4s that are big enough to put 10' long pieces of 3/4 inch white irrigation pipe which is bent from hole to hole to create the hoops. 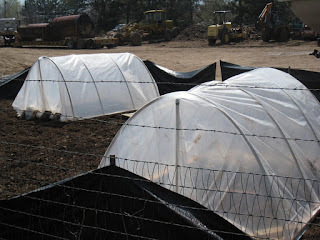 I then put plastic (6 mil or thicker plastic is preferable) over the structure to create the green house for the plants. On warm, windless days I will take the hoop house off the plants. On warm days with some wind I will open up the hoop houses to try to keep the temperature between 80-85 degrees and at the same time keep the plants safe. At night I will have a 60 watt bulb in the hoop house to warm it with a brooder over the bulb so that the light doesn't point towards the plants. You want the plants to rest at night so as little light as possible the better. The season is off and running. It is amazing how in just 36 hours these things grow. Unfortunatley the 1450 Wallace didn't germinate but we have some other great seeds that are doing very well. The soil finally got dry enough the I could do the final patch prep. Today I put down some nitrogen to make up for what was loss during the soil flush along with some PAM. PAM is my secret ingredient this year from Wallace Laboratories. To make a long story short, it turns out the manufacturer for PAM is just a mile from my house and I found it by accident. After talking to the owner of the plant and reading the scientific literature I believe PAM can give my soil the structure that it needs which will hopefully translate into big and better root structor. It is fun to watch pumpkin plant vines run and see big leaves, but at the end of the day big pumpkins come as a result of great root systems. Next steps for the pumpkin patch will be putting down some large sheets of clear plastic to warm the soil and help keep it dry from the coming rain storms and putting the hoop houses into place. Hopefully we will be putting plants into the ground about two weeks from tomorrow. The picture to the right shows the finished patch. The two stakes are where the plants will be planted. Lightly file the edge of your seed with some sand paper until you just start to see a light brown color coming through. Sanding the seed will help the plant get out of the shell and get it growing sooner. Atlantic Giant seeds can sometimes have tough shells so this helps get the seed off to a good start. Soak the seed for 1 hour in warm water with a small drop of liquid seaweed in the water. The soaking will help start the germinating process faster and the cytokinin in the seaweed helps increase germination rates and may help early plant growth. Many growers at this point will wrap the seed in a wet paper towel and then watch for the root to come out and then plant in their growing medium but I prefer to plant at this point right away so I don't have to worry about damaging the root. I am using 60% ProMix BX soil less medium for my seed starting mix combined with 40% earthworm castings from my worm bins. 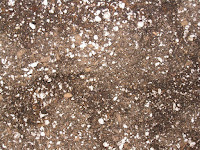 Studies have shown that new seedlings thrive in a 40-50% mixture of earthworm castings. This soil has been warmed to 80 degrees for the last 8 hours and then moistened with water so the soil is damp but not wet. I then plant the seed into the medium that is in a 9 inch peat pot (wasn't easy to find these nice big pots but I got them at a local garden center) with the pointy part of the seed down 3/4 inch below the surface. The peat pots are then placed in a small closet with a thermostatically controlled space heater at 80 degrees (about 84 degrees would be considered perfect but the thermostat on the heater only goes up to 80 degrees). 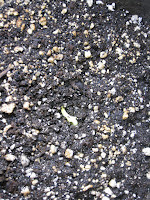 In 3-10 days I hope to start seeing the seedlings poking through the ground and at that point the season has officially begun. I got my soil report the beginning of the week and things are looking much better. The sodium levels are back into the normal range but my phosphorous and potassium levels are still on the high side. I did another soil flush on Monday which will hopefully get my potassium numbers into a more normal range. Once the soil has dried out I'll add some nitrogen to the soil to get those numbers back up (the nitrogen dropped with the soil flushes) and then we will be ready for roto tilling. 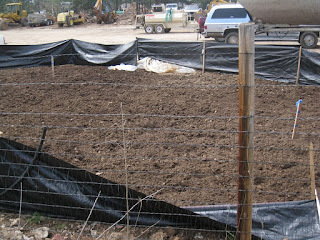 After roto tilling I'll put my hoop house over the planting area to begin warming the soil. I'm hoping things start drying out soon. We expect rain here in Denver on Thursday and Friday so I'm going to hold off on planting my seeds for a couple more days to make sure I have time to get my final patch prep completed and the soil warmed before transplanting outdoors. Pumpkin Season is Upon Us! Yea!!! There is a little known disease that runs rampant around the world in January and February called Orange Fever. Symptoms include: irritability, angry outbursts on pumpkin discussion boards, and cabin fever. If you are not familiar with Orange Fever than you don't grow or live with a giant pumpkin grower. Winter time is a hard time on pumpkin growers. There are the seed trades, soil seminars and genetic research but that isn't enough to keep the fever away. If anything all of that probably just adds to the fever. Slowly, like ice breaking on a frozen river, the fever breaks and is replaced with pumpkin obsession in Spring time. Yes, pumpkin season is upon us. Finally! 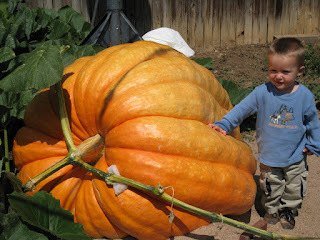 This blog, for those not familiar, is dedicated to the wonder of the giant pumpkin. 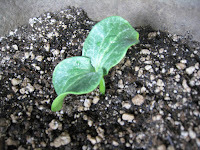 In it you can find my entire growing season from last year and tips on how to grow big pumpkins. I'm not an expert, yet. But the 755 pounder I grew last year was a great rookie start and if I can get my new soil up to par I hope to get over 1,000 pounds this year. If you would like to grow a giant pumpkin I can give you some great seeds. Planting time for most growers will be in the next three weeks. With transplanting outdoors, into hoop houses, the first couples of weeks in May. What do you feed it? Mostly a good composted soil and organic fertilizers. I water 4 times per week for a total of about 1.5 inches or more depending on weather. You want the soil to be lightly moist but not wet between watering. How do you move it? This is one was a big concern for me but it really wasn't a big deal. You simply throw a little pumpkin party at the end of the season and have 5-8 friends help you lift it with a lifting tarp. It was really fairly easy. What do you do with it when you are done with it? This is really up to you. Most pumpkin growers compost it. It takes some time and patients to be a giant pumpkin grower, but if you would like to grow a big pumpkin for Halloween it really doesn't take much effort. To get a pumpkin over 100 pounds is really fairly simple with a good Atlantic Giant pumpkin seed. Give it a try this year. You may love it! There is a great pumpkin grower group in Colorado willing to help you or leave a comment below with any questions you may have.